At the Medieval hearth a pumpkin would be buried in the embers at the end of the evening and slowly bake there all night. The pumpkin, seeds removed, was filled with cream, old bread, preserving spices and cheese. In the morning the still warm pumpkin pulp would be carved away from the sides and stirred into the other ingredients to form a thick porridge. Through years of trying this recipe I have learned to omit the embers and roast the pumpkin in pieces. 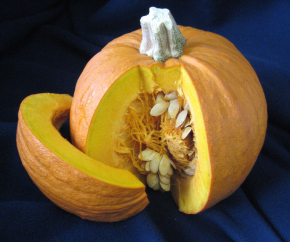 Look for the thick-fleshed variety called Sugar Pie pumpkin. Pumpkins grown for decoration are tasteless and watery. Canned pumpkin would be preferable to Jack-O-Lantern pumpkin if you can’t locate a Sugar Pie pumpkin. Also, add a garnet yam to the roasting pan. Both the flavor and texture of the soup will be enhanced. Heat oven to 350 degrees. Cut the pumpkin into 6 wedges and clean out the seeds and threads. Cut the yam into halves lengthwise. Place these on a baking sheet with ½ inch water and bake until tender (45-50 min.). Cool to handle. Peel the pumpkin and yam and cut into small cubes. In a large, heavy pot place the pumpkin, yam and all ingredients except the cheese. The liquid should just cover the solids. If not, add more stock or water. Over med.-low heat, bring soup to a simmer, cover, and cook, stirring often to prevent sticking. Simmer ½ hour. Cool slightly. Puree the soup with a stick blender or a food processor. Soup should be thick… a porridge consistency. Taste to correct the seasoning. To serve, layer soup and the grated cheese in individual bowls or layer them in a hollowed out pumpkin to serve as a terrine. In this case, pour very hot water into the pumpkin to heat and sterilize the inside for several minutes before pouring in the hot soup. You can use a Jack-O-Lantern Pumpkin as the terrine.